If you periodically import incremental updates you may wish to keep a complete record of your location data as it changes over time. 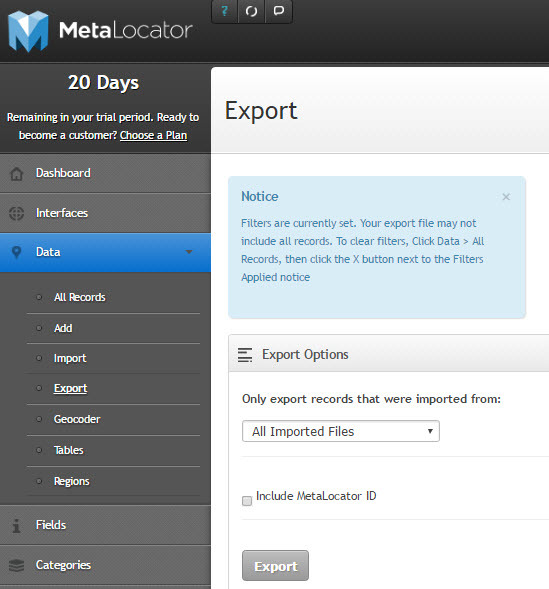 If you add/update/delete locations through the MetaLocator data interface rather than by importing. This is a good way to keep and organize your location data in one file outside of MetaLocator. When you are planning a wide range of changes to your location data you might wish to first save your most recent position of location data prior to applying updates. Having saved this data, in the event your updates do not work out as planned you can then revert to your location data before the changes through an import of this saved working location configuration. 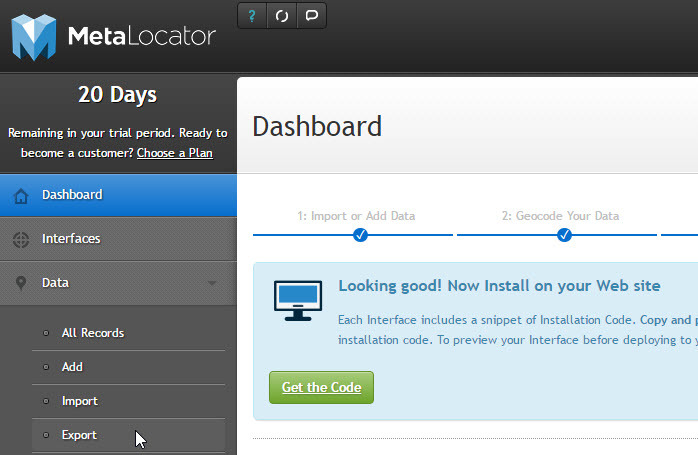 It is worth noting the export data will contain the latitude and longitude assigned to each location that MetaLocator has assign during geo-locating. This will allow you to reload (import), without incurring the time and potential cost of geo-locating your locations. Under the Data menu, select Export If you receive the following notification, it would indicate you had been using Search & Select prior to the export and as a result all records may not be exported, only those selected. You will need to clear the filter to be assured all records are included in the export. A record of prior imports will be listed under "Only export records that were imported from:" such as you see below. To get a complete backup do not select a file - select "All Imported Files". Selecting a file will export only those location records associated with that import file and as such may not be complete set of locations. 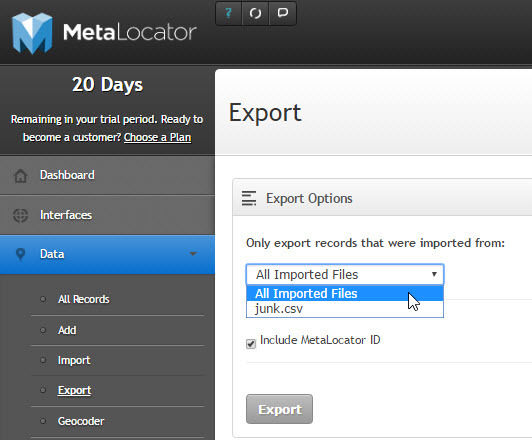 Click "Include MetaLocator ID" then press Export. The MetaLocator ID is a number the system assigned when the data was loaded and is the sequence of the location record. Identify a folder to store this file. The file name MetaLocator uses can be changed to suite your needs. The file extension "CSV" is important to retain. Following the export you may wish to open the file in Excel or another data management tool to review the content.